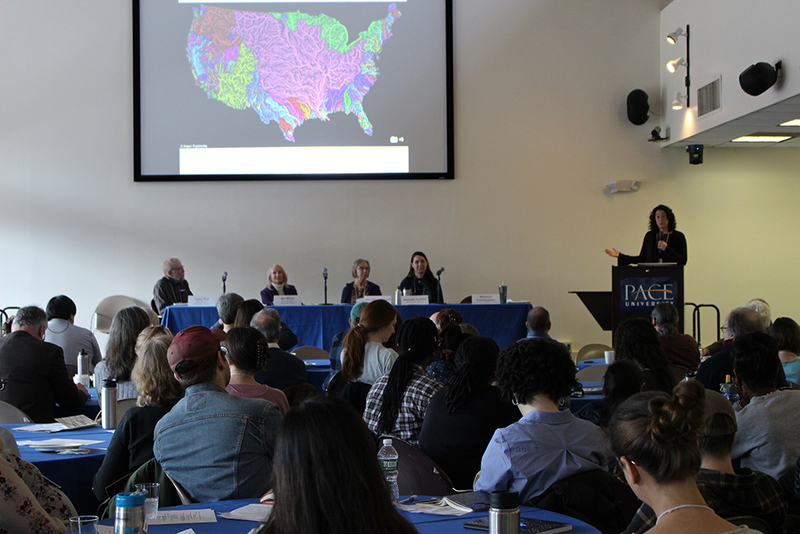 On March 1, 2018, environmental leaders gather at Pace University to discuss regional water issues and plan for action. Photos by Samantha Miller. 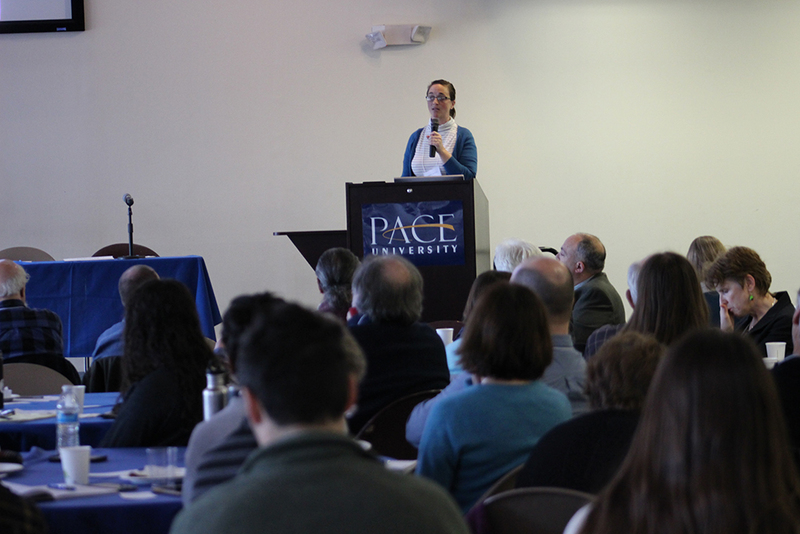 One hundred and twenty environmental leaders gathered at Pace University in Pleasantville for a regional conference organized by Sarah Lawrence College’s Center for Urban River at Beczak (CURB). Watershed activists, government officials, and scientists discussed the results of citizen science water quality monitoring along the Lower Hudson and its tributaries, as well as how they can collaborate on solutions for pressing local issues such as flooding and pollution from urban runoff and combined sewer overflows. 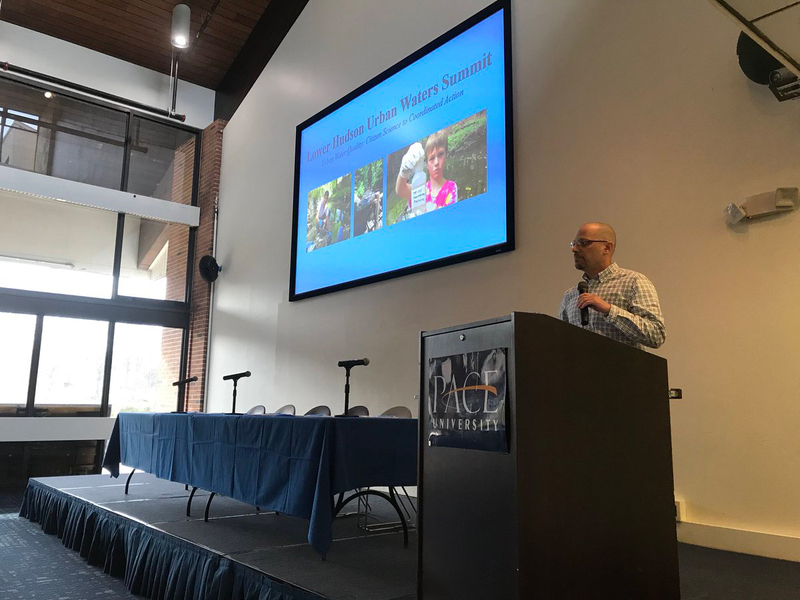 The event featured presentations from groups including Riverkeeper, the NYS Department of Environmental Conservation Hudson River Estuary Program, regional watershed alliances, and other stakeholders. 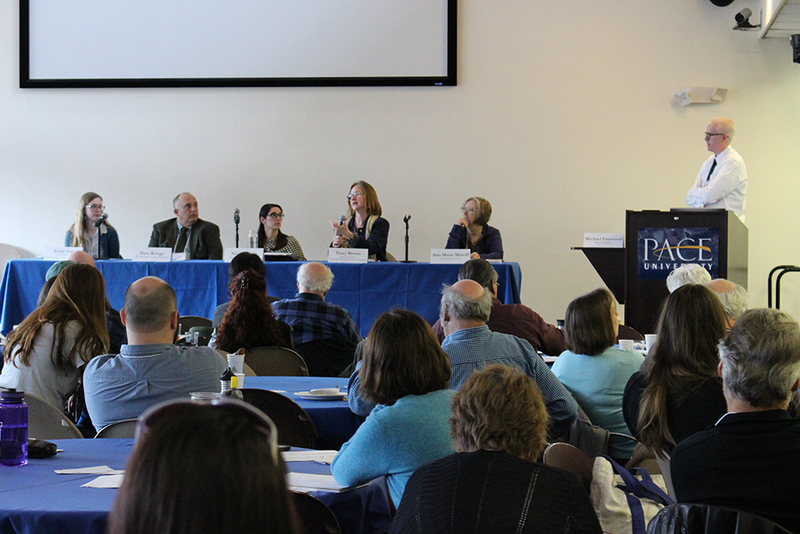 The summit also included panel discussions and breakout sessions on the latest water quality initiatives. 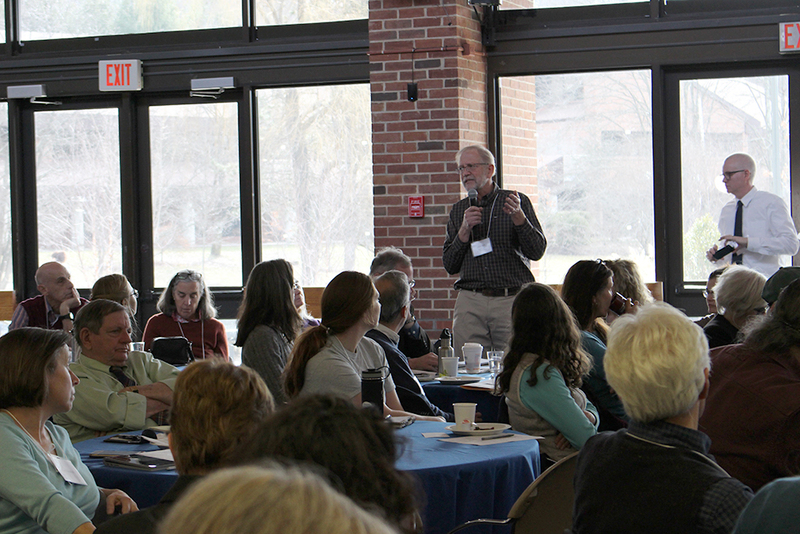 In each session amateur scientists sat alongside professionals, reflecting on the growing and critical role of citizen science in the field of watershed management. 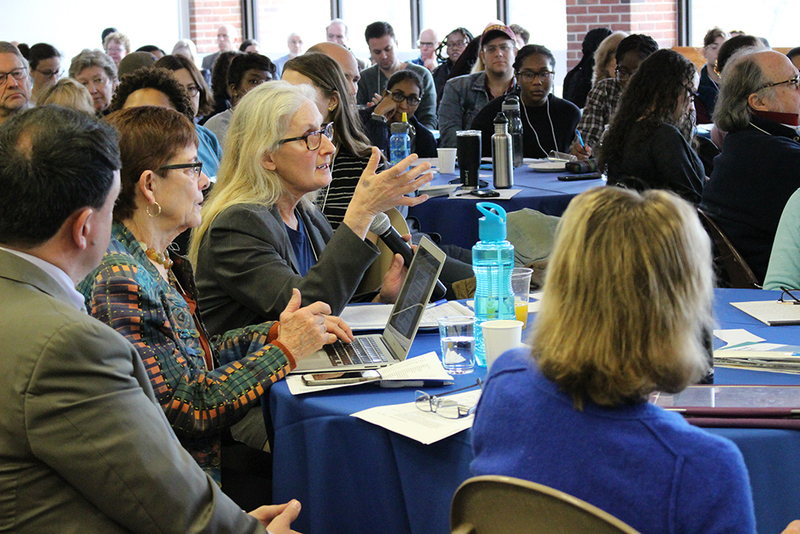 Tracy Brown from Save the Sound described these collaborations—e.g., the combination of bottom-up monitoring and green infrastructure projects with large-scale, agency-driven research and planning—as the “secret sauce” for advancing healthy watersheds. Sarah Lawrence College’s Center for The Urban River at Beczak organized the event with a team of over a dozen partners, including: Pace University’s Dyson College Institute for Sustainability and the Environment, Groundwork Hudson Valley, Riverkeeper, Bronx River Alliance, Saw Mill River Coalition, Sparkill Creek Watershed Alliance, Sustainable Westchester, Hudson River Watershed Alliance, Pocantico River Watershed Alliance, and Federated Conservationists of Westchester County. 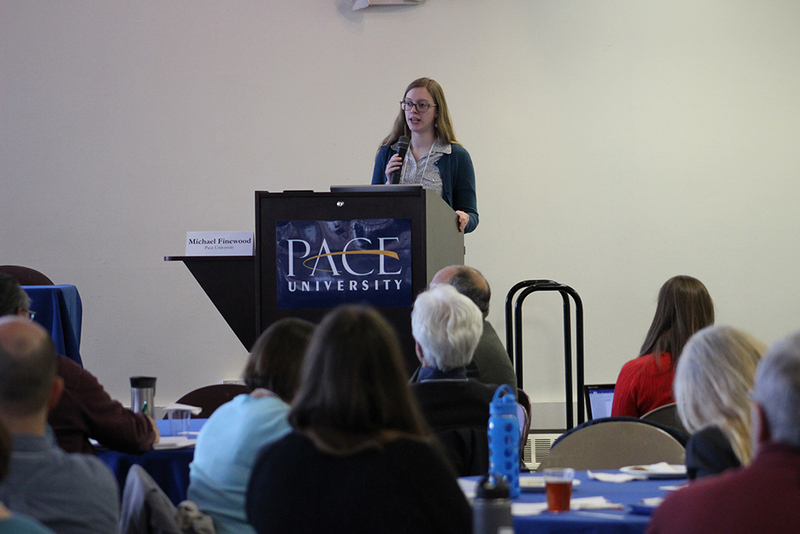 The summit was funded in part by the NYS Hudson River Estuary Program, US Environmental Protection Agency, and Westchester Community Foundation. Contributors to this post include Samantha Miller, program manager at the Dyson College Institute for Sustainability and the Environment; Donna Kowal, program coordinator at the Dyson College Institute for Sustainability and the Environment; Ryan Palmer, director of the Center for the Urban River at Beczak; and Michael Finewood, Assistant Professor of Environmental Studies and Science at Pace University.